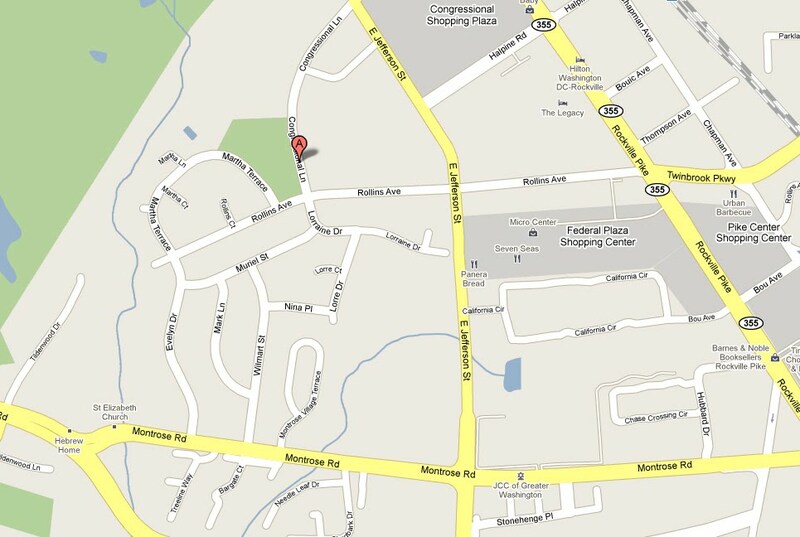 Are you in the metro-DC-Maryland-Northern Virginia area? Then meet up with The Volleyball Club! 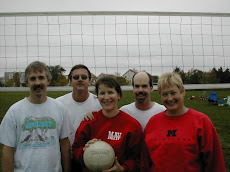 Choose from: Four person outdoor grass men's, women's and co-ed volleyball one day tournaments on Sundays OR Four person outdoor grass co-ed volleyball leagues on Wednesdays from May to October. New for 2011! Cash Prizes for Winning Teams! Breakdown of the Cash Prizes for the winning teams for all divisions! or $10 per person up to four players. or $20 per person up to four players. First Place gets $80 per team or $20 per person up to four players. Second Place gets $40 per team or $10 per person up to four players. First Place gets $120 per team or $30 per person up to four players. If we get Eight teams in a division, I will let you know on the day of the tournament what the cash prize distribution breakdown amounts to...it would be $200 per team or $50 per person up to four players. Register Online to reserve your date & spot. 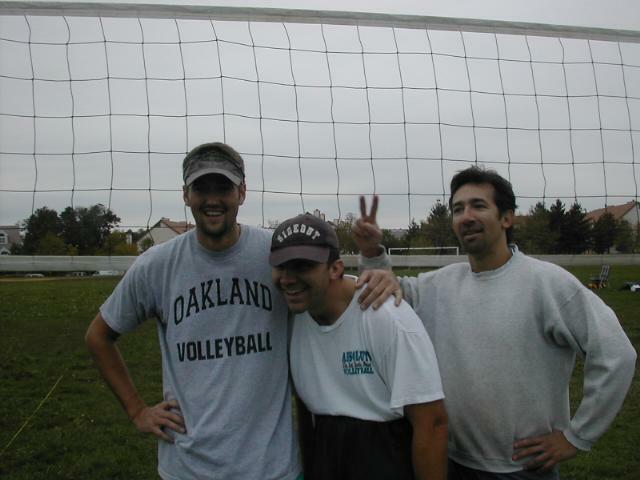 The Volleyball Club organizes four person outdoor grass men's, women's and co-ed volleyball one day tournaments on Sundays. 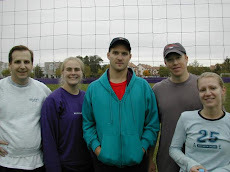 We also organize four person outdoor grass co-ed volleyball leagues on Wednesdays from May to October. 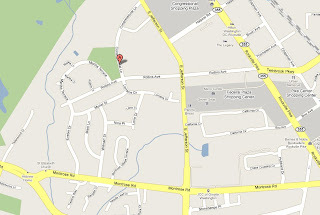 Our players have come from as far as Virginia Beach, VA to King of Prussia, PA and from Frederick, MD to Manassas, VA! As an added incentive - check out our 2010 Stimulus Plan - Play More, Pay Less! Winning teams receive an embroidered promotional item! The winning team's prizes for the different divisions are equally divided and NOT skewed to the upper level players! Have fun! The tournaments are social, fun and competitive. 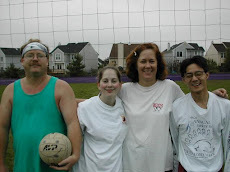 THE VOLLEYBALL CLUB OUTDOOR COED FOUR PERSON VOLLEYBALL ONE DAY LEAGUE! FINAL DEADLINE: 6/24/11, 7/29/11 and 8/26/11 for payment of fees and team and player registration. WHEN: Sunday, June 26, 2011; or Sunday July 31, 2011 or Sunday August 31, 2011. COST PER SESSION: $25/person for three matches in a four team division. LEVEL OF PLAY: All Levels: AA, A, BB, and B. (2 games: 25 point rally scoring, 3rd game to 15 point rally scoring). REFEREES: Teams provide a referee. What is the location of the tournament? 8:30-9AM on the day of the event. We accept payment for pre-registered persons or teams during this time. We request that you pre-register online prior to the day of the tournament. What time does play begin? What time is the tournament over? What is the rain-out policy? Please call Rich at 301-717-9558 to determine if the tournament has been cancelled or not due to rain. You can call Rich as early as 6:00am on Sunday morning and as late as 11:00pm on Saturday night. What if I don't have a team - can I still play? IF YOU DO NOT HAVE A TEAM, WE WILL BE FORMING TEAMS AT REGISTRATION AND PLAY ON A POTLUCK TEAM. FOOD FOR ALL PLAYERS· RAFFLE FOR 10 PLAYERS TO RECEIVE A GIVEAWAY (TVC EMBROIDERED LOGO COOLER BAG, T-SHIRT, UMBRELLA, TOTE BAG, OR HAT) BASED ON A DRAWING, A COUPON WILL BE GIVEN TO EACH PLAYER AT REGISTRATION. First Time Player? Here are some tips: Playoffs could run until it gets dark So plan accordingly. All players must be present to sign the waiver at the time of check-in. Bring your own ball . We provide lunch and water but you may want to supplement with b ring ing your own food , snacks and drinks . You may want to bring Sunscreen, Sunglasses, Hat, Sweatshirt, Sweatpants, gloves if necessary. Aspirin for headaches and lotion for bee stings. Chairs , blankets , umbrellas, tents or canopies can shield you from the hot sun.A boombox to listen to music while you are playing and resting in between matches. Are there prizes for the winning team? YES - The winning teams receive prizes (PROMOTIONAL ITEMS)What are the amenities at this location?· WATER STAND· INDOOR BATHROOM FACILITIES· OTHERWhat is the level of play?ADULT MENS/WOMENS/COED AA, A, BB, B AND C IF AVAILABLE. JUNIOR (6’S ONLY AND MEN AND WOMEN ONLY), IF AVAILABLE AND SENIOR DIVISIONS (AGES 50 AND OLDER), IF AVAILABLE. Rally scoring to 25 points (Number of Games TBD) against each team in Division and Playoffs. Four and Five Teams in Divsion: Top two teams make playoffs. Six and Seven Teams in Division: Top four teams make playoffs. How can I register online? Fill out the online PRE-registration form to sign up yourself and or your team. Or, if you prefer --print & complete the registration form. Be sure to arrive at 8:30AM on the day of the tournament to final register - and pay fees. Be sure to visit our sponsors below!